Holly bushes (Ilex aquifolium) are often grown for their attractive red berries, but it is only the female bushes that produce this fruit. But the berries won't be produced at all unless there is also a male holly bush in the area to pollinate the female flowers. The holly plant is an example of a dioecious plant—one in which the male and female reproductive systems occur on separate plants. While most plants are monoecious, with each plant containing both male and female parts, plants such as holly, blueberries, bittersweet, and asparagus require a mixture of male and female plants in order to pollinate and produce fruit and their enclosed seeds. While all holly plants will produce flowers, any given plant will have either all male reproductive parts or all female parts. Therefore, it's important to the horticulturalist, nursery owner, or interested homeowner to know how to select both male and female plants when the goal is berry production. If you have holly shrubs that fail to produce fruit, it is likely for one of two reasons: you either have a male plant, or you have a female plant with no nearby male plant to offer pollination. It is easy enough to distinguish male holly plants from female plants by closely examining the structure of the flowers, which generally appear in May on this plant. Male holly flowers have four yellow stamens extending from the center of the flower. 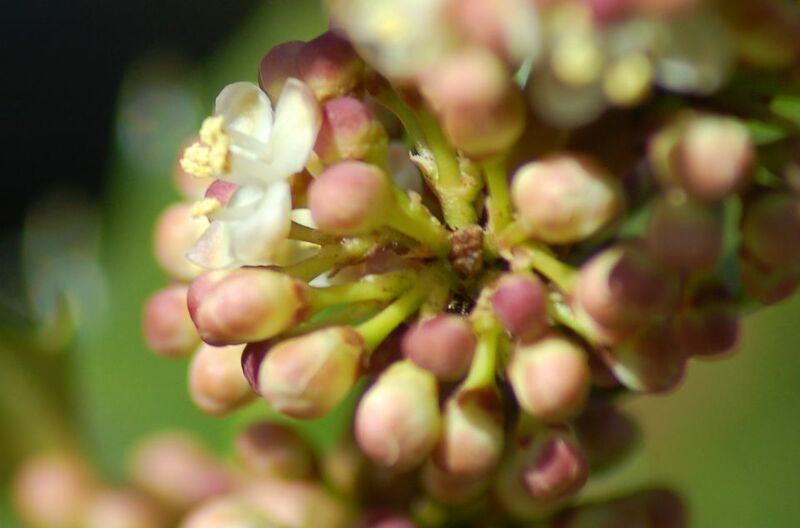 By contrast, each female bloom has a green ovary (that is, a green "bump" in the center of its bloom. In the photo shown above, you can see four small yellow protrusions extending from the center of the flower. These are the stamens—the male parts—of the flower. A plant exhibiting these can be reliably identified as a male plant. If holly is a common shrub grown in your neighborhood, you may not have to worry about the gender of your hollies, since there is a good likelihood that is at least one male plant in the vicinity, which can pollinate a great many females. If you are aware of one or more male holly plants somewhere nearby, the ideal scenario will be to buy all female plants that will produce the attractive red berries. If you are uncertain about the presence of male shrubs, however, it will be important for you to buy at least one male plant to pollinate the female shrubs you buy. It will generally be enough to buy only one male. Better garden centers will distinguish between male and female plant so you can intentionally buy the ones you want. While most of the holly shrubs offered at garden centers will be females, they should clearly identify the male plants to make your selections easier. While berry production will be most robust if you have both male and female shrubs in the same area, there are some hollies that are self-pollinating. When self-pollinated, these shrubs will produce smaller berries and fewer of them, but you will indeed get some berries. Some varieties known to have a limited capacity for self-pollination include: 'Nellie R. Stevens,' foster hollie, and burford hollie. However, do not expect these plants to produce the impressive display of berries that are possible if they are fully pollinated by separate male plants. Tall Shrub or a Small Tree?